In the heart of Montargis, an area known as "the Venice of the Gâtinais," a town in bloom, close to shops, the Bridges circuit, and the Chinese circuit, Hervé Pasquiet and his team wish you a warm welcome. 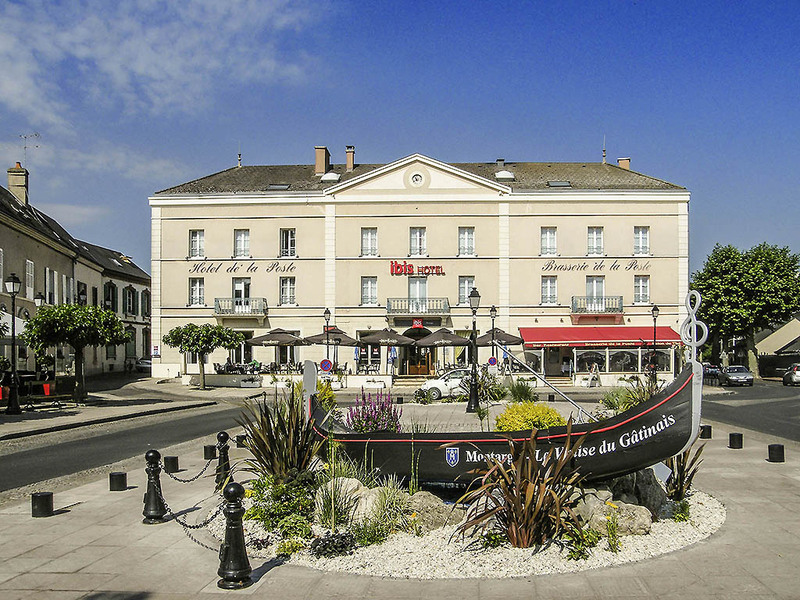 The ibis Montargis hotel and its 1900s retro style La Brasserie de la Poste restaurant welcome you to the heart of Montargis, the Venice of Gâtinais, and the nearby Chateaux of the Loire. The hotel is ideally located at the entrance to Rue Dorée and its s hops, close to the river port and Passerelle Eiffel. Discover the town by foot by following the Bridges circuit or the Chinese circuit, a symbol of cultural exchanges from the 20s. Discover the Venice of Gâtinais by taking the Bridge Walk. Discover the city from the hotel. Retro 1900s brasserie with terrace in good weather. Enjoy homemade cuisine, made by our chef using local and regional produce such as Gâtinais saffron and Montargis pralines. The room and check in were good. Room was much bigger than expected with a big crib. Dinner and breakfast were poor. In a convenient location for onward travels. Hotel was fine and kindly contacted us concerning items we accidentally left in the room. Although the room was a little warm it was very comfortable and the restaurant was excellent. Breakfast was above average for this type of hotel. Reception friendly , helpful and efficient. Room very good. Restaurant excellent. As usual my stay lived up to my expectations. It is always reassuring to see familiar members of staff on my visits, proving to me there is a good management in place. It was ok. Nice size room and good breakfast. Decor very tired though. Some fixtures broken. We had a one night stop in Montargis - the Ibis was a great choice as it was close to the town centre and canals, and also had a restaurant - which we ate at. Friendly welcome by reception and other staff. We used the paid secure parking. The room was reasonably sized, with a comfortable bed and a good shower. Buffet breakfast had good choices for us. We were pleased with the room overlooking the square, but there was still the smell of cigarette smoke from a previous occupant. Also there were cigarette buts on the balcony floor, and the window frames on the outside were unclean. Good location in town centre, friendly staff, parking in basement @ €6.50 per night. Very narrow entry to parking. Clean room with all the usual facilities. Good food in the restaurant (menu just in French). European style breakfast with good variety. The hotel is ideally situated and the rooms are very quiet. The restaurant is quaint and the food very good for a reasonable price. Unfortunately the air conditioning in the bedroom was not working when it was over 35° outside. The staff tried to find us another room but the problem was the same . In spite of that, we enjoyed the place and appreciated the secure garage. Hotel ok parking fine given direction it was easy.Room slightly worn out,but bed was fine and restaurant next to hotel was nice looking,wife meal was nice but my frites were soggy.Bigest complain was just one voucher for gold member,I thought that went away long time ago. We enjoyed our stay, Beds were very comfortable, Staff very helpful, and a good selection at Breakfast, overall excellent. Room was clean and functional. Room lacked certain things, such as iron/ironing board, that are good for business travel, but not necessary for leisure. Always needed additional towels. Food was good. Service at front desk always excellent. Friendly professional staff. Needed more effective dehumidification; summer climate in a town defined by multitude of canals. The hotel is very well located. The room are standard and clean. The team is welcoming. The hotel is perfect for a night or 2 while visiting the area. Want to enjoy Montargis? Stay at the Ibis.